In Nuremberg, paintings by Adolf Hitler were to be auctioned off in an auction house. The public prosecutor’s office assumes that these are forgeries. It has seized a total of 63 Hitler paintings. As is well known, Adolf Hitler tried unsuccessfully in his young years to be accepted at the Vienna Academy of Art. Before the First World War he also tried to keep his head above water as an artist with extremely moderate success. From this time some pictures are preserved. Some collectors are willing to pay exorbitant sums for paintings by Adolf Hitler. In 2014, for example, a picture of Hitler on which the old Munich Town Hall can be seen was auctioned off for 130,000.00 euros. The high price has nothing to do with the artistic quality. One can assume that such high auction proceeds can only be achieved because the pictures were created by the greatest criminal in human history. 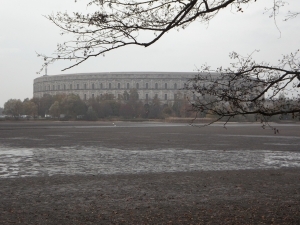 It was in Nuremberg of all places, the city of the Reich Party Days (the photo above shows a section of the Nazi Party Rally Grounds) that 63 Hitler paintings were to be auctioned. But the auction has now been stopped. The public prosecutor’s office Nuremberg-Fürth assumes that the offered works are forgeries. An art expert looked at the pictures and came to the conclusion that the works signed with “A.H.” or “A. Hitler” were forged. The pictures are now in state custody, experts from the Bavarian State Criminal Investigation Office check whether the suspicion that they are forgeries is actually true. The public prosecutor’s office has initiated an investigation into forgery of documents and attempted fraud against unknown persons. The public prosecutor’s office spokeswoman said that they now investigate where the works came from, who owned them and who might have known that they may not be originals. It is particularly noteworthy that in press reports announcing the auction there are also pictures of expert opinions in which the authenticity of the pictures is explicitly certified. Some of the expert opinions date from the 1980s and were written by August Priesack. However, these appraisals are not particularly reliable. Priesack is one of the experts who fell for Konrad Kujau, the forger of the Hitler diaries. But that doesn’t change the fact that – should the current accusation be true – the counterfeiters made much effort to present the pictures as genuine.